Fast, efficient, professional, line painting. Line sports fields in winning time. Now you can manage, plan and accurately design sports fields before any paint ever hits the ground. 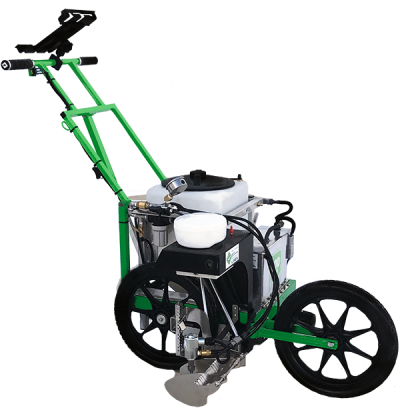 Save time and money with our uniquely designed POD painter and SWOZI RTK GPS controlled line painting equipment. Utilize these field designs to precisely paint your sports fields in winning time. Field marking paint, uniquely delivered. Simplify your paint handling operations utilizing our bulk, professional, ready-to-use refilling service. Our latex marking paint is chemically balanced, cost effective and environmentally friendly. Combined with our functional set up and supply, users can maximize efficiency and reduce labour all season long. Game-day ready sports field line painting services. It’s crunch time. You need your sports fields painted with eye-catching lines that jump off the field. Simplistic Lines Inc. has provided weekly or bi-weekly line painting services and accurate field conversions since 2003. We’re here to ensure your sports fields are game-day ready.